Passionate volunteers in Cardiff are being asked to come forward to help form a new fundraising group to support Alzheimer’s Research UK. The UK’s leading dementia research charity is looking for people with a range of skills to help set up a group, which will aim to raise vital funds and awareness across the city. 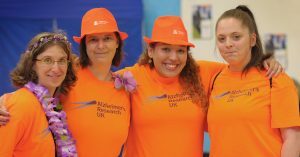 Members can get involved in a variety of ways, from getting stuck into fundraising challenges to raise money for pioneering research to representing Alzheimer’s Research UK at events and spreading the word about the charity within their local communities. The charity’s regional fundraising groups play a crucial part in the fight against dementia, which currently affects around 43,000 people across Wales. Alzheimer’s Research UK powers world class studies focusing on prevention, diagnosis and treatments for dementia and has funded 22 research projects in Wales totalling £2.6m. The charity provided a grant for Cardiff University’s Dr Adele Pryce-Roberts who is looking at APOE4 – an Alzheimer’s risk gene. Different versions of APOE can either decrease or increase a person’s risk of Alzheimer’s. The researchers are growing brain cells with different versions of the gene, investigating how the risk gene affects the strength of connections between brain cells. This project could help develop new approaches to protect nerve cells and prevent memory loss. Alzheimer’s Research UK Champion Carolyn Morris, who lives in Castleton, near Cardiff, is keen to see people in the city come together to support the fight against dementia. Alzheimer’s Research UK’s new Regional Fundraising Officer for Wales, Ceri Smith, will be on hand to provide advice, materials and assistance when needed. She said: “Dementia has a huge impact on families and it’s important to us at Alzheimer’s Research UK that communities have the opportunity to come together and get involved with supporting dementia research. “Regional fundraising groups are vital in helping us to defeat dementia, both through raising funds and helping to spread awareness of this cruel condition. “Alzheimer’s Research UK’s vision is a world free from the fear, harm and heartbreak of dementia and our supporters are key to helping us bring about the first life-changing dementia treatment by 2025.